Casually Provence: To the streets! The French word for “strike,” grêve, contains the word rêve, dream. Maybe that’s why going on stri ke seems, to an outsider at least, a national pastime. 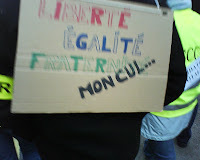 Lengthy visits to France will almost always be marked by some social movement. When, in the early 90s, we lived in Lyon, there was a major strike by truckers. O.K., that’s not so bad, you might think. The truckers did not, however, just stay home. They rode their trucks out onto the highways and blocked them. People had to become experts at alternate, little-used routes and at maneuvering a zig-zag maze that the truckers had deftly structured so that some traffic could flow. Today (Thursday 29, January) promises to be a major day for disruptions since all the major unions have called for a day of mobilization. Workers will stay home, teachers will not report to school, post offices will be closed, buses, subways, trains and airplanes will operate on greatly reduced schedules. At noon today, I turned on the local news, only to get reruns of magazine-type broadcasts, and a banner reading that the network’s personnel were on strike. France’s workers are, surprisingly, not unionized in great numbers. But where they are unionized, e.g. subway and train workers, they can cause maximal disruption. Being a commuter in Paris today will be one exercise in frustration and ingenuity. Why the movement? The official themes are wide and general: displeasure with the center-right ruling party’s economic policies; demands for job security; concern about stagnant or lowered purchasing power. The most left-leaning of the three major dailies, Libération, highlighted the word “exasperation” on its front page today. The world economic crisis is making the exasperation worse as more and more people are laid off. Other European countries are looking at today’s French demonstrations to gauge how deep and wide is public displeasure. Projections are that the strike will be widely followed, even in the private sector, which would be significant. The number of people who turn out for street demonstrations will also be telling. Across Europe a malaise is setting in, even for those who are educated. Young people with degrees have been finding it difficult to get good paying jobs or even stable employment until many years after they have received their diplomas. Perhaps that is why surveys show close to 70% of the general population as active supporters or at least being sympathetic with today’s mobilization. 75% answered “yes” when they were asked whether they thought the movement was “justified.” These are high numbers for a series of actions which will disrupt the lives of folks throughout the country. It’s hard to imagine a movement of such scope in the U.S. Impossible, really. First of all, such national coordination would be hard to achieve. Second, strikes like those of Air Traffic Controllers in the 80s, and at Caterpillar in the 90s, failed miserably. Third, companies are good at playing hardball, and have the friends in elective positions to support them. WalMart’s threats to shut down stores instead of accepting unionization has teeth in it, as indicated by the company’s closing of a store in Quebec. Finally, the US populace, in general, is just not as sympathetic to workers as is the case here in France. Imagine the abuse striking subway workers would receive at the hands of stranded, angry urban commuters. Do young Americans even remember the concept of "sympathy strikes"? The French, on the other hand, still tend in great numbers to sympathize with the little guy. One reason has to do with what I call “projected self-image.” French people, well-off city dwellers though they may be, nonetheless see themselves as paysans beneath the surface, linked to their ancestors, close to the land, little people, without much power. They also see themselves as continuous with a history which reminds them that, faced with power (King, State, Multi-National Corporation) nothing will change unless there is a massive, concerted, and unified effort.